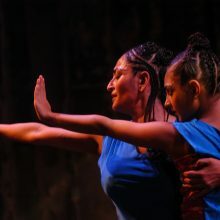 Duurbaar, “unstoppable” in Bengali, explores stories of loss and struggle, sexuality and sensuality, and women’s relationships to femininity. It is inspired by the relentless striving of marginalized women around the world to keep going, to realize horizons when none are visible, and to create light when all seems dark. 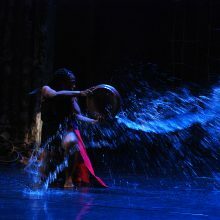 After moving through sections of loss and letting go, of regeneration and connection, Duurbaar ends with a celebration of transcendence and joy, where women flood the stage with water, dance in “wetness,” and explore the materiality of flow. 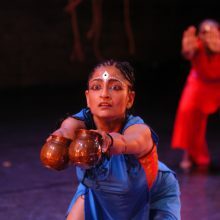 Duurbaar is created from a deconstruction and intersection of the Indian classical dance style, Odissi, yoga, Mayurbhanj Chhau (a martial art style originating in the Baripada district of Orissa) and influences from the north-eastern classical style of Manipuri. 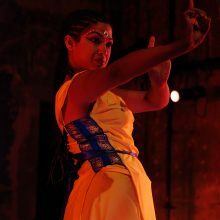 Dancers train rigorously in Odissi and yoga and are introduced to Chhau. Duurbaar is the culmination of a year-long creative process that includes: story-gathering workshops led by Beverly Cottman where we mined the richness of women’s stories and collectively created a narrative that inspire the choreography; performance workshops on vigilance led by renowned theatre activist, Dora Arreola, and anti-sexism/ anti-racism workshop led by Shannon Gibney and Ananya Chatterjea. 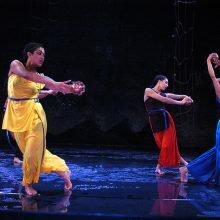 Dancers continue the dialogues through group discussions and list-servs. This complex investigation determines how movements based within these dance forms and drawn from daily life are incorporated into the choreography. Ultimately, the process is about creating a movement aesthetic and sensibility through which this diverse company of women artists of color finds its voice. 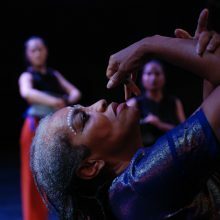 As I approached the dance studio for the first time, I heard what sounded like the thunder of horses behind the door and wondered aloud “Who’s playing the drums?” It was a rush to discover that powerful sound was coming from the bare feet of a dozen or so women pounding the floor in perfect unison. I knew then this project would be anything but boring! 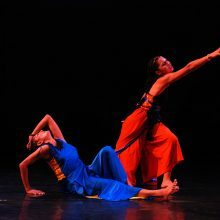 It’s been a fascinating collaboration with Ananya and her dancers, and a valuable one because while contributing a ‘directorial eye’ to Ananya Dance Theatre’s vision, I’ve also had my own artistic perceptions expanded. Like all good art, the themes and images in Duurbaar are both spiritual and yet very concrete. Duurbaar resonates in the mythology woven by our individual imaginations as well as the documentary backdrop of ancient history and this morning’s global news. 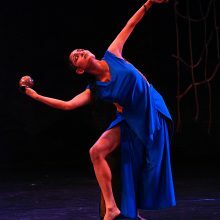 Ananya Dance Theatre invites the audience to accompany them on a journey, an exodus, a pilgrimage. Leaving behind catastrophe, discord, and death, these sisters/mothers/daughters set out together seeking a new horizon where there awaits, for the steadfast traveler, a place of safety, strength, self-knowledge and wonder.